I remember being so excited when it was Easter egg decorating day! My little sister and I would put our aprons on and line up the colored dye cups in an assembly line and start decorating. I wish I had all the ideas back then that I do now because the eggs would have been much more interesting looking. So now, when I help my niece and nephews on their egg decorating day I’ll be prepared with some of the BEST ideas out there. I’ve searched the internet for the coolest most unique looking egg decorating ideas and these five top my list! Enjoy!! 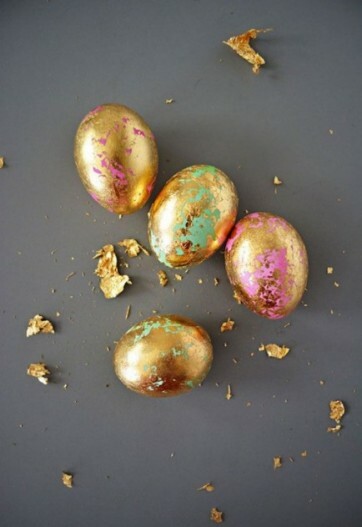 1-Golden Eggs: How fab are these. Dip your eggs in colored dye. One dry, add gold leafing. 2-Pastel pattern eggs: Add a few elastic bands around the eggs in funky patterns then dip in the pastel dye. Once dry, remove the elastic bands to see the pattern you’ve created. 3-Swarovski Eggs: Using craft glue, adhere flatback rhinestone crystals in varying sizes. Try using varying shades of the same color for a cool look. 4-Black & White Eggs: Modern and simple. Using a black permanent marker, write something sweet for the lucky one who finds this egg. 5-Nail Polish Eggs: Pour a combination of your favorite nail polish colors into a cup and dip the egg on each side, capturing the random blobs of color.